Best part: The pithy comedic moments. Marvel’s cinematic universe for the past four years has been building up to the superhero flick to end them all. With many characters getting their own blockbusters such as Iron man, The Incredible Hulk, Thor and Captain America, their interweaving story-lines have finally woven into the ultimate team on a mission film. 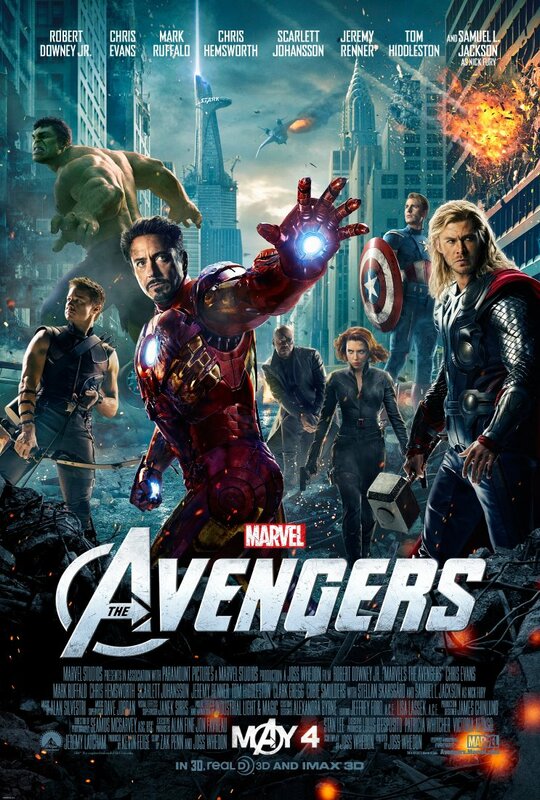 The Avengers defies extreme expectations and concerns to become one hell of an intense roller coaster ride. 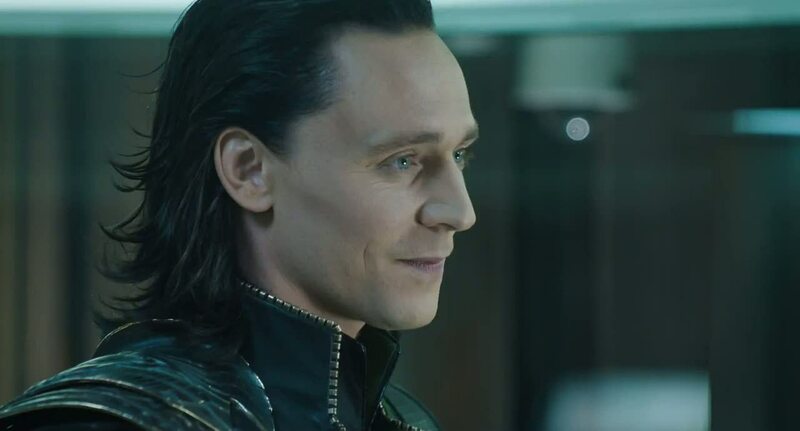 As we saw in 2011’s superhero flick Thor, Loki(Tom Hiddleston)’s deceptive and disastrous ways have only just begun. With Earth the setting for his assault, the fabled Tesseract device is all that’s needed. His violent theft of the device has forced scarred SHIELD director Nick Fury (Samuel L. Jackson) to bring together an elite and superhuman group to stop Loki’s wrath upon mankind. Tempers flair, reputations are preceded and alliances are engineered from scratch as this team of vastly different superheroes must protect the Earth from anyone threatening its destruction. Luckily for the average film-goer, the Iron Man, Incredible Hulk, Thor and Captain America films don’t need to be seen to enjoy this high octane sensual experience. Writer/director Joss Whedon has created a hilarious, action packed and emotionally gripping superhero adventure fitting for a climax to this series. His penchant for strong character development, clashing egos, arse kicking women and witty dialogue are all on show in The Avengers, not very surprising coming from the creator of mega-hit genre TV shows such as Buffy and Firefly. Much like his underrated sci-fi actioner Serenity, the characters come first as he gleefully toys with the concept at hand. Focusing for the first half on bringing these wildly differing and engaging characters together is The Avengers’s strongest power as every POW! and BAM! is met with a satirical one liner and unexpectedly hilarious moment of physical comedy. These characters serve as the building blocks for something extraordinary in the first half as fighting each other must be put aside to fight the forces of evil. The chemistry developed slowly and uneasily between this cast of famed superheroes from varying ages and galaxies creates a fascinating origin story of arguably the greatest team in superhero lore. 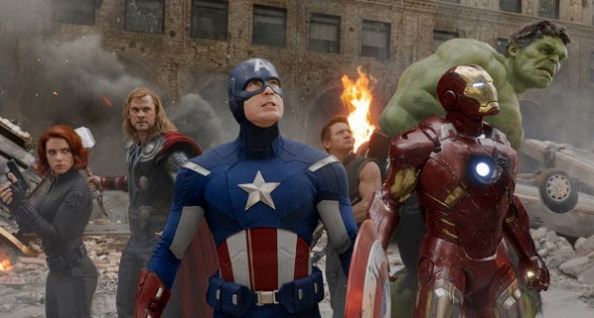 Every character pulls their weight, and no one steals the show, as we see every character earning the right to be accepted into the Avengers Initiative. “The Avengers. That’s what we call ourselves; we’re sort of like a team. “Earth’s Mightiest Heroes” type thing.” (Tony Stark/Iron Man (Robert Downey, Jr.), The Avengers). 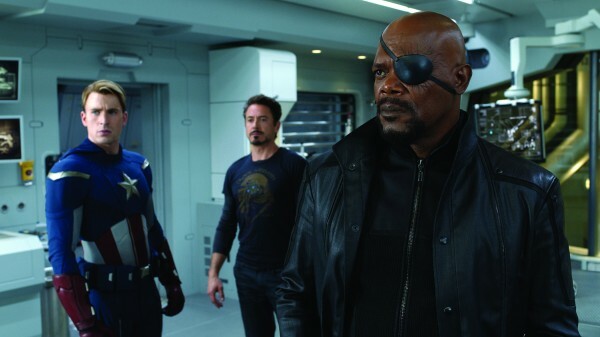 Samuel L. Jackson, Chris Evans & Robert Downey, Jr. The witty Whedon-esque dialogue is of course met with brilliant performances from this A- list cast and the creation of burdened yet likeable characters. Powerfully making his presence known in both Iron Man films, Robert Downey Jr. as Tony Stark is a delight. His quick delivery of comedic lines and upbeat presence on screen lets everyone know why Iron Man is a fan favourite. While Captain America (Chris Evans) makes his presence known; placing his differing views, emotional torment, and leadership anxieties in full view. Scarlett Johansson’s Black Widow and Jeremy Renner’s Hawkeye don’t disappoint when called upon to anchor the film’s emotional core. While credit goes to Mark Ruffalo as the big, green, mean machine turned pleasant scientist Bruce Banner. Given the unfortunate task of replacing Edward Norton from the previous film, Ruffalo delivers an enjoyable yet intensifying interpretation of Banner, constantly toying with the monster inside him. When these superheroes aren’t using their unique abilities and witty personalities on each other in several of the film’s most intense moments, they’re destroying New York while tussling with Loki and his army of alien minions. Despite several inventive and beautiful action set pieces throughout, including Captain America and Iron Man working together to save the Helicarrier, the final third kicks into overdrive. It’s here when we see this team working side by side in the line of duty. Its hilarious, stylish and breathtaking all at the same time as we see the powers of our favourite heroes in full effect. Whedon creates an immersive representation of the forces of good. Single shot set pieces zooming around the city depict each member of the team risking everything to come to the aid of one another, while impressively destroying hordes of evil doers. One things for sure, this cracking foray into the origins of the ultimate crime fighting unit is a paradise for comic book aficionados, action fans and everyone in between. Whedon, the impeccable cast of comic book favourites and consistent level of laughs come together to create one of the best superhero films ever assembled. Verdict: An enlightening and powerful superhero flick. Best part: The first action sequence. Wort part: The jingoistic flair. Starting off by saying Hollywood is out of ideas is obvious when applying that statement to Battleship. With a ridiculous concept in creating a special effects extravaganza based on the popular yet plotless board game of the same name, It makes you wonder what Hollywood may decide to adapt next. This film provides some visual stimulus but little beyond that to satisfy either film aficionados or even fans of the classic board game itself. Taylor Kitsch & Tadanobu Asano. We begin our descent into nostalgia and mind numbing stupidity with renegade and good for nothing slacker Alex Hopper (Taylor Kitsch) and his brother Stone (Alexander Skarsgard); celebrating a birthday, family ties and Naval prowess. 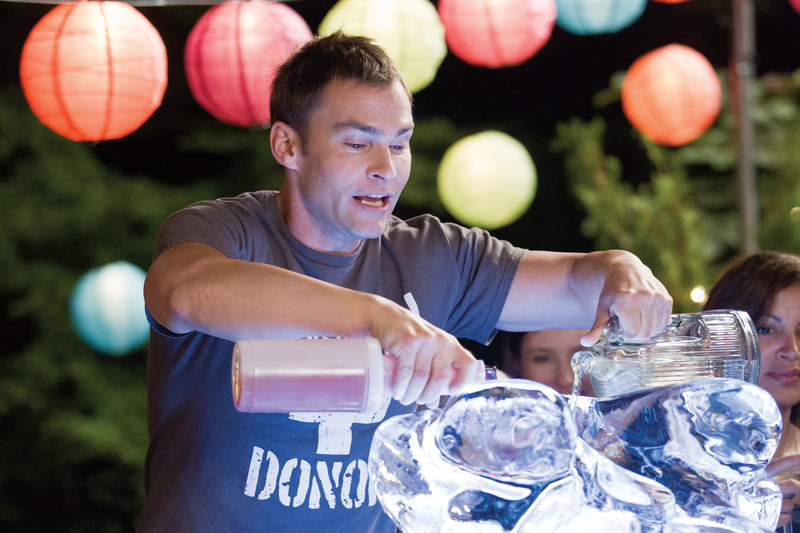 When Hopper tries to impress Samantha (Brooklyn Decker) and ends up breaking the law, he is forced by Stone to join him in the Navy. We then join them in full uniform and unlimited egotism as the annual Naval war games between the USA and Japan get under way in Hawaii. Due to scientists sending a signal to a planet much like ours in another galaxy, a strange cluster of objects fall out of the sky and into the Pacific Ocean. Disrupting the fleets in action, this alien group reigns war upon them and threatens the imminent destruction of mankind. Its now up to misfit Hopper and a sole Naval fleet to set aside differences and save the world from an overwhelming enemy. 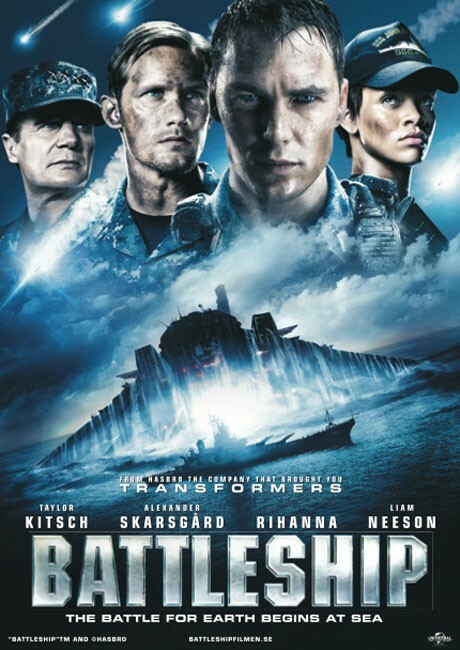 Battleship is a prime example of the slapdash effort both directors and screenwriters put into blockbusters such as this each year. With the Transformers sequels and Battle: Los Angeles also suffering from major script and directorial failings, providing nothing more than a cash grab for a general audience is becoming more noticeable with each one of these cliche sci-fi action flicks. Peter Berg (The Kingdom, Hancock), who should be able to provide a convincing level of flair as acclaimed director Michael Mann’s protege, leaves behind entertaining characters and clever moments of comedy seen particularly in Welcome to the Jungle in order to achieve the conventional. This film may stand as one of the most generic blockbusters in recent memory. Even when looking down the cast list we see the who’s who of popular culture, several trying to make a name for themselves in one way or another. First off, Kitsch, fresh from the recent fantasy adventure epic John Carter, provides his usual emotionless delivery for another bland lead character role. While pop-star Rhianna, essentially playing Vasquez from Aliens, is unable to hold off her Caribbean accent when spouting several of the film’s many unnecessary one liners. Also suffering is an unconvincing Brooklyn Decker as Hopper’s girlfriend and soon to be fiancee. While phoning it in is Liam Neeson as Admiral Shane, who seems wasted in a role involving little more than a glorified cameo. “We are going to die. 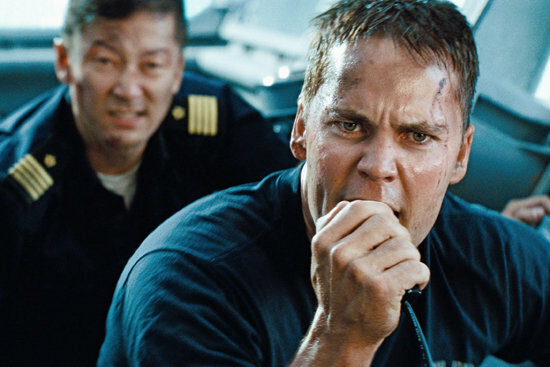 You’re going to die, I’m going to die, we’re all going to die… just not today.” (Alex Hopper (Taylor Kitsch), Battleship). One of many Naval battles. In their defence however, the dialogue throughout is solely based on endless references to Sun Tsu’s The Art of War, corny speeches proclaiming America’s ability to do anything and eye-rollingly tedious one liners. Battleship‘s moments of comedy fall flat and border on offensive; particularly when providing a one sided view of the Japanese. While the jingoistic view of American accomplishment is irritatingly pumped into this film, along with the unsubtle commercialisation of the Navy and Marine Corps. Loving shots of naval vessels and obvious metaphors for peace created by the US try too hard to convey a flag waving subtext. The noisy, special effect driven action sequences may look beautiful, but fail to provide any real creativity. Buildings fall down, people are needlessly killed in large quantities, free ways are crushed by Transformer-esque alien burrowers and battleships fire endlessly at alien spacecraft while being fired upon themselves. This repetitive and monotonous level of destruction does however start off promising. The first battleship sequence, one of few elements resembling anything from the board game, is choreographed, paced and photographed to create a thrilling 10 minute fight to the death against overwhelming and unknown odds. The aliens themselves, despite possessing some of the weirdest spiky beards in memory, are one dimensional at best. Their Halo-like jumpsuits along with conventional grey, slimy designs provide an uninteresting enemy for our heroes to bravely face. 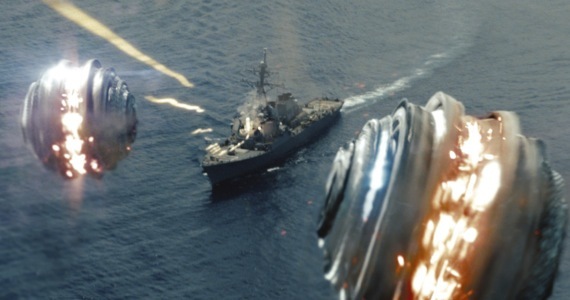 With Hollywood scrambling for ideas, we’ve reached the point where Battleship is the biggest blockbuster on the menu. Sinking the director, cast, and Universal Pictures, this bomb destroys all the ships on the board! Verdict: A mind-numbing and excessive blockbuster. 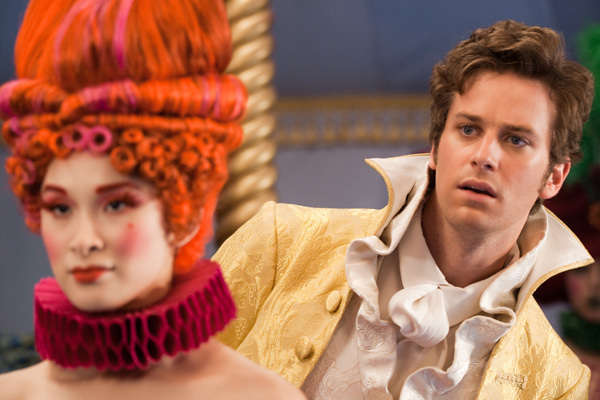 Interpretations of classic fairy tales seem to be part of a new Hollywood trend. Among them comes a surprising number of re-tellings of the Grimm Brother’s story Snow White. 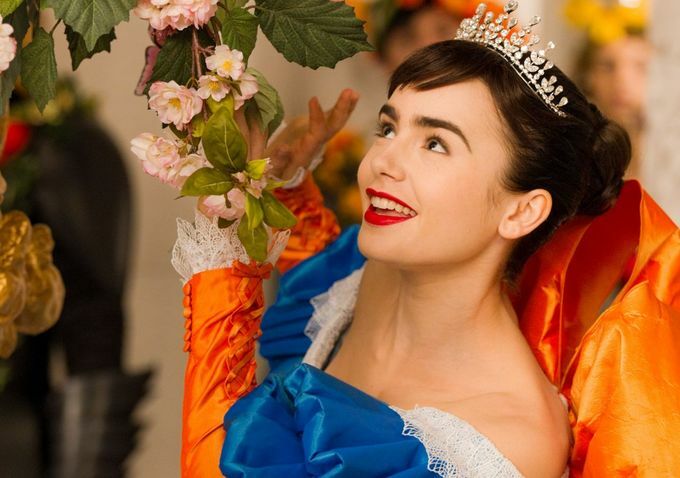 With Snow White and the Huntsman out in the coming months, we first arrive at a seemingly lighter retelling with Mirror Mirror. This kid friendly, bombastic affair will remind you of the fun animated Disney adventures significant to our childhoods through the eye popping visual style of special effects master Tarsem Singh Dhanwar (Immortals). A fresh look at a stale story is what we see here as we are told by the stuck up and disgruntled evil Queen (Julia Roberts) that her version of events is far more enthralling than Snow White(Lily Collins)’s. We are thrown into the story as the Queen’s wicked ways push Snow over the edge, to the point of leaving the confines of the castle in search of adventure. The Queen’s destructive rule over the village forces Snow to stand against her. Banished to the woods, Snow recruits seven wacky yet resourceful dwarves, all the while charmed by the presence of courageous yet modest Prince Alcott (Armie Hammer). Along With Tim Burton and Michael Bay, Singh has a keen eye for visual imagery but is unable to extend his reach towards convincing storytelling. With all the charm and flair of a musical, Singh’s visual direction in Mirror Mirror attains wondrous new heights. Particularly impressive is the ball sequence in which the castle is flooded with patrons dressed as members of the animal kingdom. His style allows the main characters to stand out in bright colours against plain colour settings, such as Snow’s visit to the decayed village in bright yellow, to illustrate the importance of Snow White’s journey of defiance. The costume design by the late Eiko Ishioka, CGI effects augmenting the wacky slapstick gags and zany fight sequences and the set designs uniquely representing the light of the castle and dark of the woods create an ingenious third dimension for the film without the use of 3D. While a cheerful and catchy song and dance number provides an extra surprise for this already enchanting visual splendour. The use of a brilliant 3D animated exposition sequence, keeping one up to date with the legend, will make you question whether displaying the whole film in this style would lift the film above a dull story told by a somewhat incapable director. This retelling makes a fatal mistake in focusing on the evil Queen. Mirror Mirror is noticeably awkward during scenes involving the Queen in all her pampered glory. “It’s important to know when you’ve been beaten. 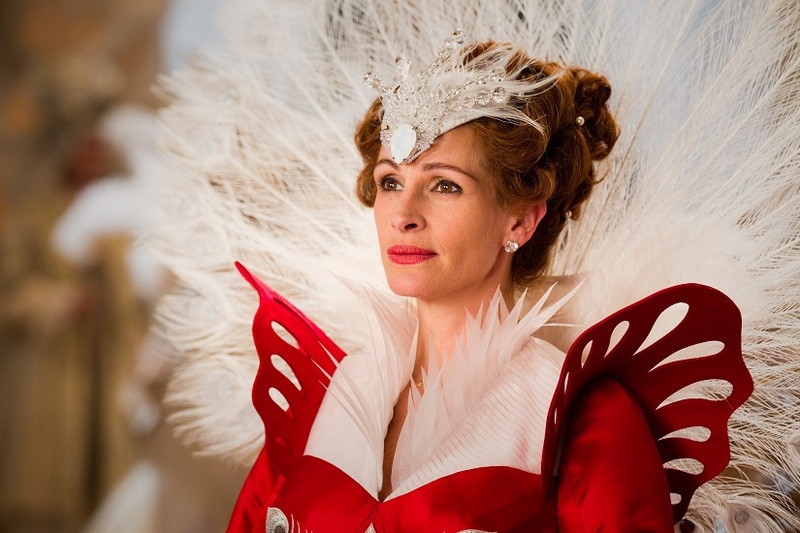 Yes?” (The Queen (Julia Roberts), Mirror Mirror). 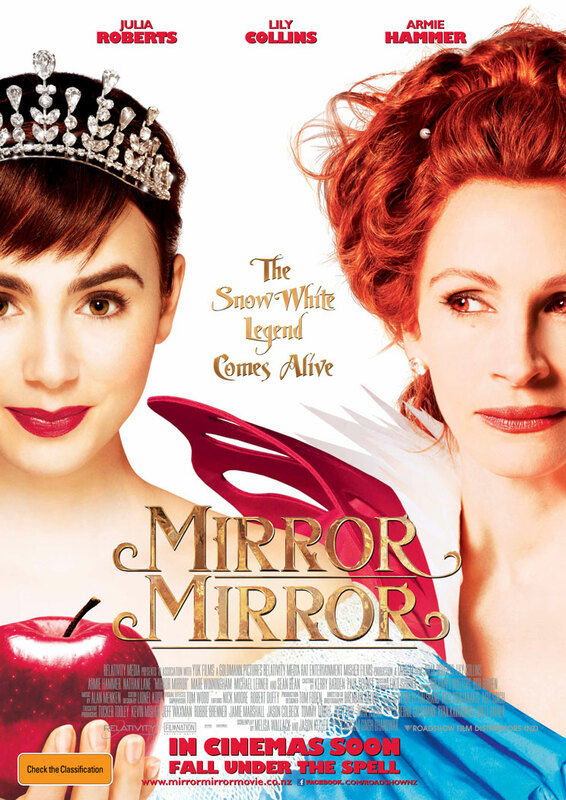 Despite the clever use of the mirror providing a guardian angel in the Queen’s own form, the castle scenes, involving awkward slapstick comedy and unending scenes of dialogue, only add to the desire to return to the classic story of Snow White and her band of height challenged compatriots. Not to mention, an uncomfortably flat performance from Julia Roberts is a clear sign of her inability to be anything more than her usual charming self in films like Erin Brockovich and Pretty Woman. Nathan Lane does however provide some much needed comic genius as the mistreated yet amusing boot licker Brighton. Thankfully, and ironically, scenes involving the dwarves never fall short. With differing personalities than usually depicted in the Snow White legend, their comedic delivery and natural chemistry create the true heart of the film. The training of Snow White in becoming a bandit is handled with the wit sorely lacking in the majority of the film. Both good looking and charismatic actors, Hammer and Lily create a funny and light hearted relationship though their enjoyable performances. The chemistry between Prince Alcott and Snow White works wonders for several of the otherwise bland dialogue sequences while their sword fight may be one of the most engaging and expertly choreographed in recent memory. Mirror Mirror, piggy backing off the current fairytale adaptation trend, certainly wears its influences on its well-pressed sleeves. Despite the spirited cast and gorgeous production design, a certain aura of unoriginality fills the air throughout. Verdict: A calculated and misguided retelling.